Was born at St. Germain-en-Laye, France, in 1847, and succeeded to the title in 1880. He was President of the Astronomical Society, and M.P. for Wigan from 1874 to 1880. He was also President of the Camden Society. Earl Crawford has made a number of voyages in his own yachts. In 1905-1906 he sailed in the s.y. Valhalla on a long and interesting voyage, visiting South America, South Africa, Ceylon, and the islands of Madagascar, at the same time carrying the mails to Tristan da Cunha. The voyage commenced early in November, 1905, and the Valhalla arrived home in May, 1906, and a valuable collection of rare birds was secured on the voyage. Earl Crawford is fond of cruising. 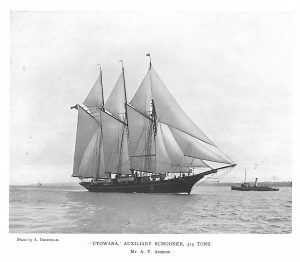 Utowana, Auxiliary Schooner, 513 tons. Mr. A. V. Armour. As Lord Lindsay he owned the schooner yacht Venus, 390 tons. This was followed in 1899 by the Consuelo, 546-ton s.y., and in 1901 by the Consuelo, 708 tons. 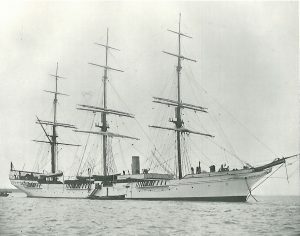 In 1901 also he purchased the magnificent full-rigged ship Valhalla from Captain Laycock. He was elected a member of the Royal Yacht Squadron in 1874. Lord Crawford raced Valhalla in the ocean match from New York to the Lizard in 1905, and won third prize against ten competitors: Ailsa, Hildegarde, Atlantic (1st), Endymion (4th), Hamburg (2nd), Thistle, Fleur-de-lys, Sunbeam, Apache, and Utowana. Residence: 2, Cavendish Square, W.